I think graham crackers are the most misunderstood cookie ever eaten. 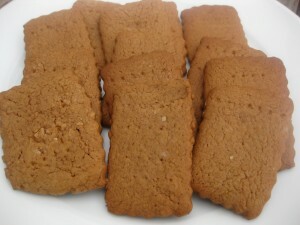 This is such a simple little cracker/cookie that never has gotten enough attention. Kind of like Cinderalla. Add some buttons and bows and dress her up and she becomes a beautiful young lady. Well, you can do so many things with this plain little graham cracker. Over the years I have made so many different desserts using graham cracker crumbs. Everything from pies, tortes, smores, pineapple puff balls, and was probably one of the first cookie/crackers I let my kids eat when they were toddlers. These graham crackers were part of a recipe for Nanaimo Dessert Bars and this recipe was adapted from Nancy Silverton’s La Brea Bakery book. I first saw this recipe on Smitten Kitchen’s website and thought they would be fun to make and then when this Nanaimo Challenge came up from The Daring Kitchen, I decided it would be a good time to try the homemade graham crackers. The graham cracker was developed back in 1829 by a Presbyterian minister Rev. Sylvester Graham as part of the Graham diet. 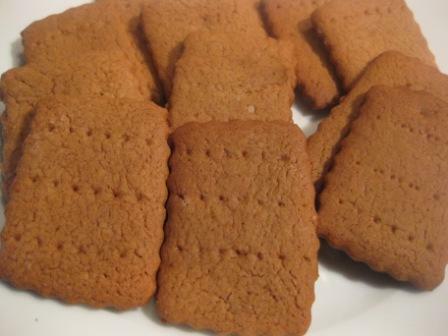 Even though it is called a cracker it is more like a digestive biscuit (according to Wikipedia). 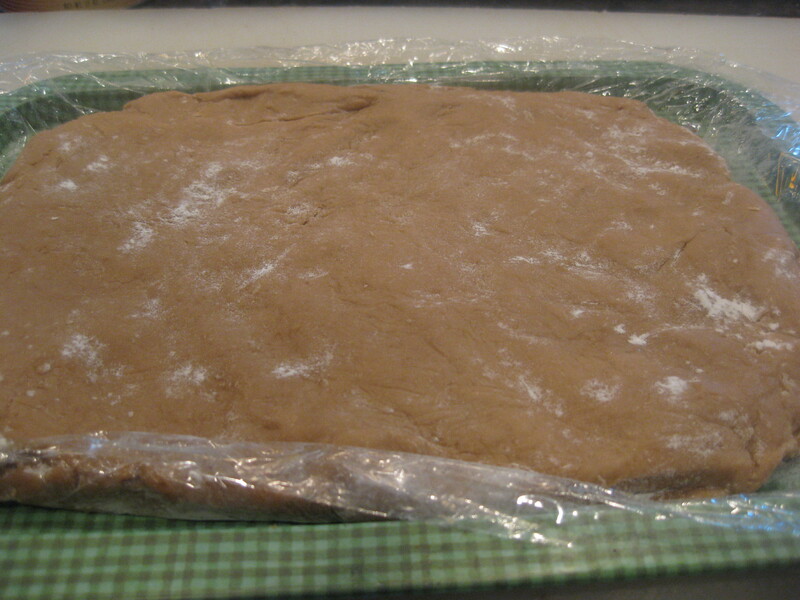 This is what the dough looks like when it is ready to go into the refrigerator to chill. All rolled out. I used a fork to prick the tops. Finished cookie. 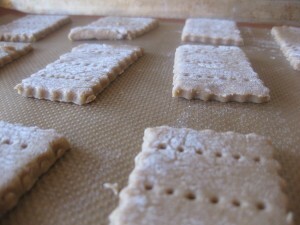 Next time I will put the cinnamon topping on them even though a traditional cracker does not have cinnamon in it. Combine the flour, brown sugar, baking soda, and salt in the bowl of a food processor fitted with the steel blade or in the bowl of an electric mixer fitted with a paddle attachment. Pulse or mix on low to incorporate. Add the butter and pulse on and off or mix on low until the mixture is the consistency of a coarse meal. In a small bowl, whisk together the honey, milk and vanilla extract. Add to the flour mixture and pulse on and off a few times or mix on low until the dough barely comes together. It will be very soft and sticky. 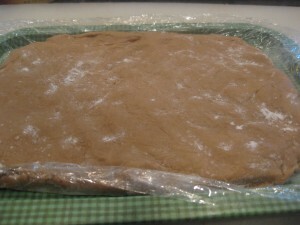 Lay out a large piece of plastic wrap and dust it lightly with flour, then turn the dough out onto it and pat it into a rectangle about 1″ thick. Wrap it, then chill it until firm, about 2 hours or overnight. Meanwhile, prepare the topping, if using, by combining the sugar and cinnamon a small bowl and setting aside. Place the crackers on one or two baking sheets lined with parchment or Silpat. Sprinkle with the topping. Chill until firm, about 30 to 45 minutes in the refrigerator or 15 to 20 minutes in the freezer. Repeat with the second batch of dough. Gather scraps together into a ball, chill until firm and re-roll. To decorate the cracker: Mark a vertical line down the middle (I didn’t do) of each cracker, being careful not to cut through the dough. Using a toothpick, skewer or fork, prick the dough to form two dotted rows about 1/2″ for each side of the dividing line.